On Monday 4 December 2017, teachers and students from Czech Republic, Austria, Finland, and Italy had the opportunity to talk live with ESA Astronaut Paolo Nespoli, who is currently living and working on the International Space Station (ISS) for the VITA mission. Where does the oxygen on the International Space Station come from? Are there plants on board that help produce breathable air? Many films depict humans living in space and on space stations. What are some of the biggest inaccuracies, from a scientific perspective, regarding how the human body behaves in microgravity? 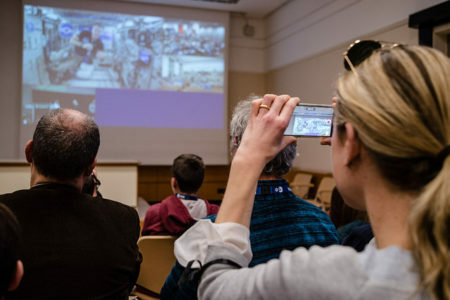 In addition to the inflight call, the local events featured a range of activities, including talks from national space experts about the many benefits of space technologies, exploration, and research- encouraging teachers and students to explore how space contributes to the advancement of society through spin-offs and innovation, promoting international cooperation, and providing inspiration. Watch the recording of the live-streamed inflight call here. Read more about the inflight call here. See the Flickr gallery from the event here.